Welcome back to another His + Her's post! I know it's been a couple of months since we have updated this section of the blog, but we love doing these and always plan to bring content together. Today, Andy and I have partnered with MVMT watches and we're so excited about it. When Andy and I were first started getting to know each other in our relationship (True Story) he would always mention to me how he totally loved all the MVMT watches and that he would be so excited the day MVMT ever reached out to me to work together on a collaboration. Well, here we are! 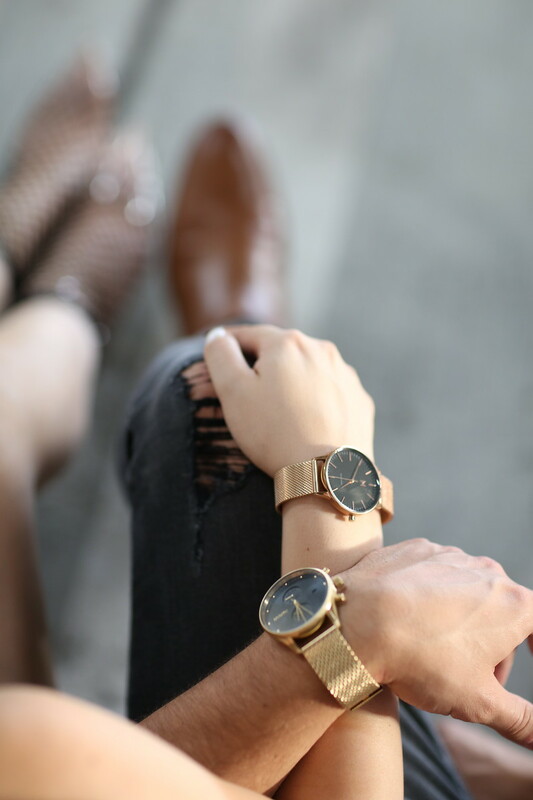 We love to wear our watches together, and it's definitely one accessory that is easy to style with your significant other for a monochrome look that will style up the both of you. MVMT has created my own personalized discount code for you all to use. For $15 off any purchase, use code: FASHIONMUSE15 at checkout. Be on the lookout for more His + Her's posts coming soon.